The Backup camera for street sweeper Has a 120° Degree viewable angle, its waterproof and has auto night vision. The camera is one of the most durable we have, with incredible adjustability and night vision clarity. The RV Box camera has a metal sun shield visor to protect you from glare and pebbles. This rear view camera can take a direct hit from a rock and it will still work like new, you can mount this anywhere on your aerial lift, some have also used this specifcally on a cherry picker. This camera is wireless (up to 70ft) as well so there will be no need to run a cable. It can also run on a battery if you want that option. Up to 70ft this system will work for you. If you need a higher range we have high range that go up to 120ft. 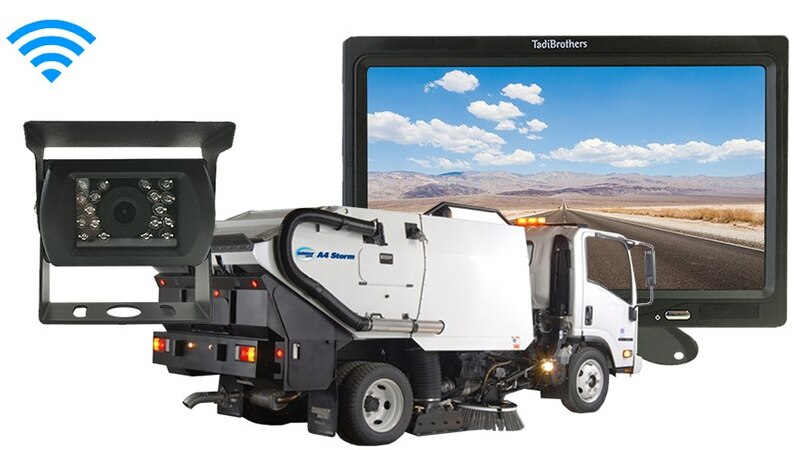 This Street Sweeper Backup Camera system, like most of our vehicular products that have an LCD screen, can be used for video gaming, Considering that a perk or bonus for purchasing our back up system (others block that feature). "I tried to connect the wireless transmitters to the 12 V of my system but the wires to connect the 12 walls are too thin it took me a while to get it working. When I was finally done I am relatively satisfied with the product but I think they could’ve been me improve the quality of the wires it doesn’t have to be so thin I have to admit that the servers a parent was extremely helpful throughout the whole process but my review has to be honest reception was pretty good, the wires were too thin. After spending weeks shopping on eBay and buying different transmitters dad didn’t even go for 10 feet I guess Tadibrothers beat them all I just think that the price of the transmitter was a little expensive but what can I do it was still better than anything else I saw there let’s hope it holds up. Youcan be sure that I will be back and update this review if there’s a problem. I really do want to send a thanks to Eddie and Tommy who took care of me after service department I know that I can be a little difficult as a customer but they were very patient with me and ultimately my transmitter were working and I guess that’s all that matters. "